Jumpsuits can function as more than glorified unitards. Case in point? The “Elektrodress”, a rehabilitative suit for individuals suffering from multiple sclerosis, cerebral palsy, Parkinson’s disease, rheumatism, and other neurological disorders. 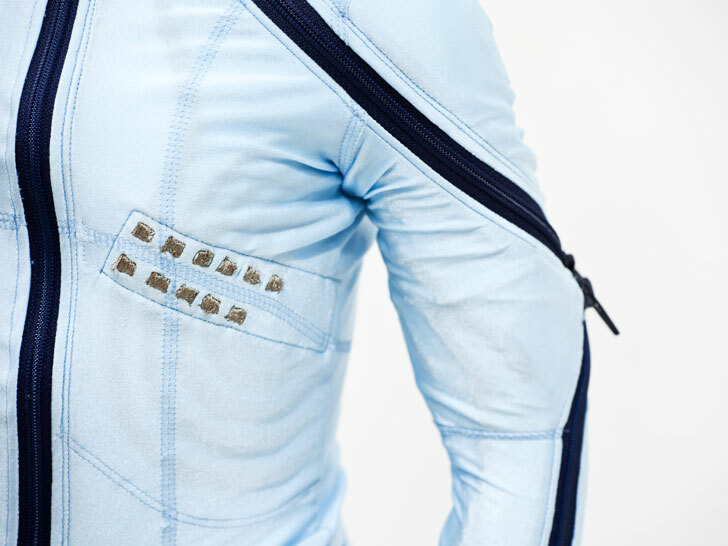 Invented by Fredrik Lundqvist, a chiropractor in Sweden, the Elektrodress features a series of electrodes that stimulate or inhibit under- and over-functioning muscles. By using vibration therapy to modulate muscle tone, the suit promises relief through relaxation, increased mobility, and improved functioning. Designed to work in tandem with a qualified therapist, the Elektrodress promotes motor and sensory functioning by reading and counteracting improper muscle tension. Each suit can be customized in a variety of ways to reflect its wearer’s age and rehabilitation needs. Because defective muscle tension is the cause of most diagnoses of musculoskeletal pain, the Elektrodess has the potential to function as a power aid in ameliorating chronic pain. Lundqvist first pitched the concept on the Swedish version of Dragon’s Den. Lundqvist first pitched the concept on the Swedish version of Dragon’s Den, a reality TV show that pits would-be entrepreneurs against a panel of venture capitalists. The “dragons” liked his idea so much they awarded Lundqvist 2 million Swedish krona ($300,000) in investment funding. The Elektrodress is currently green-lit for a late-2012 launch. Jumpsuits can function as more than glorified unitards. Case in point? The "Elektrodress", a rehabilitative suit for individuals suffering from multiple sclerosis, cerebral palsy, Parkinson's disease, rheumatism, and other neurological disorders. Invented by Fredrik Lundqvist, a chiropractor in Sweden, the Elektrodress features a series of electrodes that stimulate or inhibit under- and over-functioning muscles. By using vibration therapy to modulate muscle tone, the suit promises relief through relaxation, increased mobility, and improved functioning.